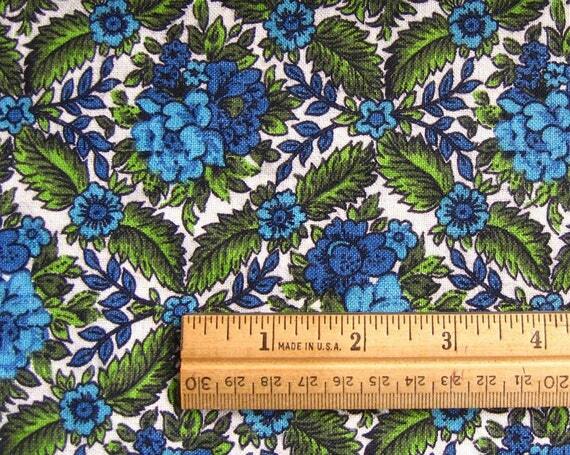 I'm taking a pause from my usual Friday Featured Fabric as we are preparing for a major town event. Tomorrow is our 4th annual City Wide Yard Sale in Ponchatoula! 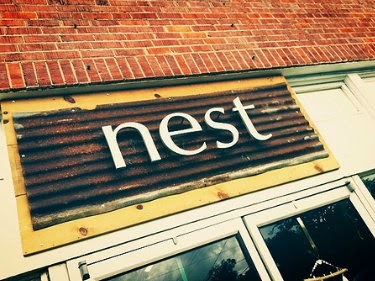 This year we have over 60 listings from businesses and residences, including my business, Nest Interiors. It's a ton of work but lots of fun plus I get to unload odds and ends from home and the shop. Having a few years under my belt, I started really early organizing my loot but I somehow still don't feel ready...because come 6am tomorrow it will be a frenzy! Soooo...Whatcha doin' this weekend? Big plans, eh? In my world - I'll be livin' the goood life when Arrested Development returns tomorrow on Netflix AND in a couple days I'll be joining in the inaugural Steotch Mystery Stitch Along! Aww...sweet! Rarely do the stars align for great tv and an awesome cross stitch project! Enjoy the pool y'all...I'll be hanging with my threads! Memorial Day Weekend is upon us! 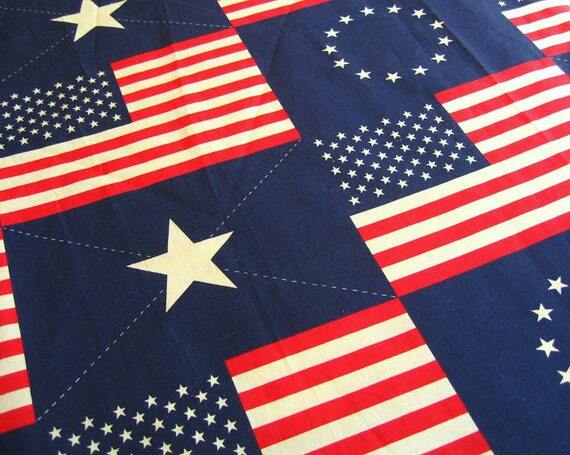 Here's a patriotic vintage-y flag fabric (it is an out of print fabric from Fabric Traditions dated 1990; technically vintage but still pretty new in my book). 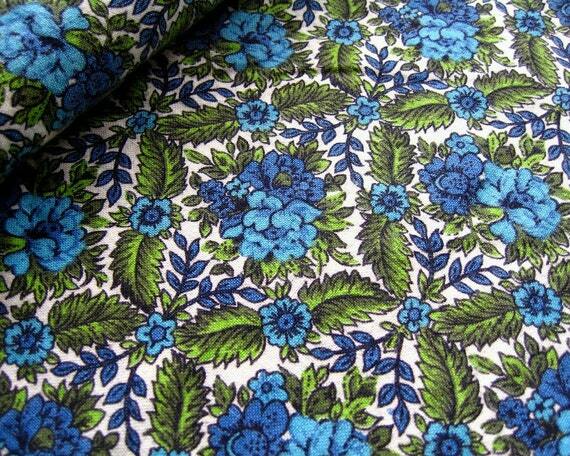 I love it and saved a bit in my own stash; so only 1 yard is available! 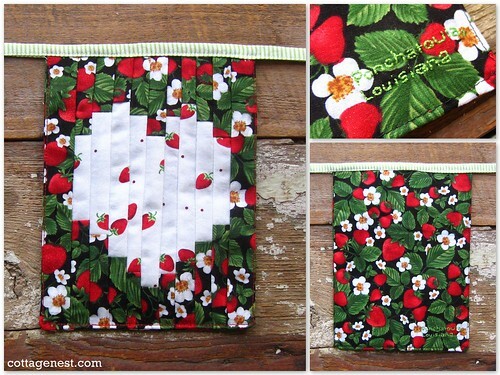 I might offer some smaller remnants after I finish my own project (but first - I will need to start my project). Fourth of July is nearly here, so don't wait! Grab it here. Gah! 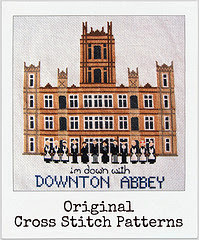 It's my cross stitch pattern, Down with Downton Abbey - modified by Elpoo in needlepoint AND a tea cozy! 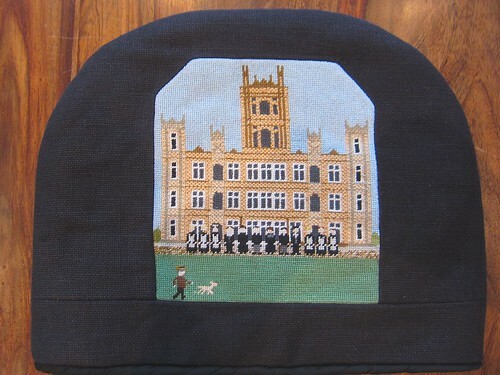 She even added Lord Grantham with his dog and detailed the castle with a brick stitch. Bravo!! 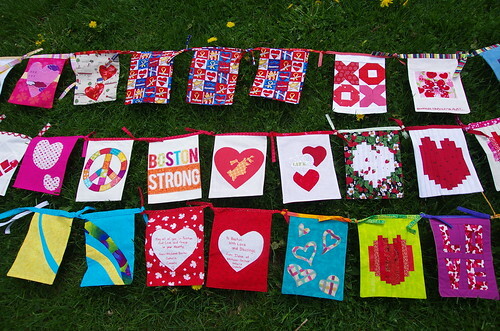 And a special thanks to the local news team of Action News 17 and reporter Joan Davis for picking up the story of my flag for the To Boston With Love project. I hope it inspired a few more flags from my region! 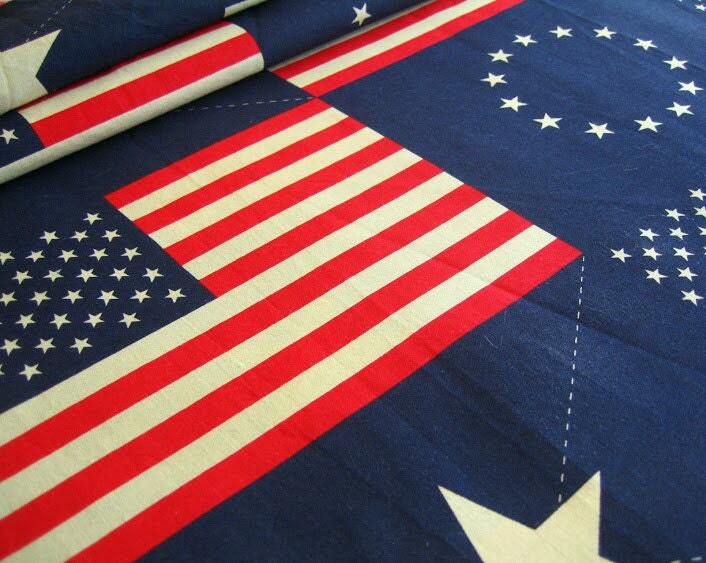 Time is short if you are interested in making and sending a flag - find out more here. Also, I saw that my flag (the strawberry print heart) made it to Boston and is being prepped with other amazing flags for the show this Memorial Day! We had an amazing weekend; the shop was busy-busy with everyone snapping up last minute Mother's Day gifts. I finished up the mini-series Top of the Lake on Netflix (anyone else watching - oh my, that WAS good) Of course, I really just wanted to play outside the whole time, which by Monday (my day off) I finally did!. Most of my time was spent weeding...are there any natural remedies...that work...for weed prevention? Anywho, take a look at my gorgeous flowers! My day lilies are super impressive right now - I actually forgot about the one pictured; what a nice surprise! The rose shown has also been a surprise. I bought it several years ago as Rina Hugo - an intensely pink tea rose. Life happened and my care for it faltered and this delicate antique pink rose popped up in its place. I suspect it may be the root stock. Rina Hugo is a French Rose and this looks like Maidens Blush - also a French rose known for its hardiness. (I actually much prefer this rose than the previous). And what gardening adventure would be complete without a little wildlife. I saved this turtle going to the street; as you can tell - he seems overwhelmed with gratitude! 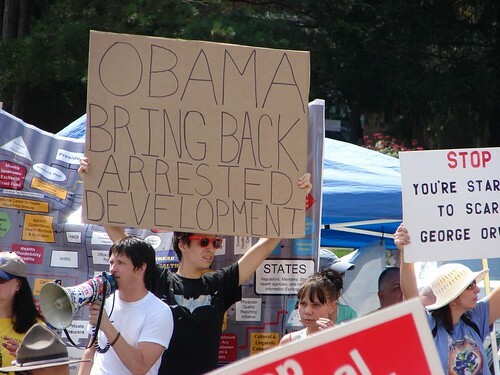 Another oldie but goodie! I listed this last week on Etsy and have it in store at the shop's sewing center - it's getting quite a bit of attention so I figured I better highlight this fabric before it's gone. A thick cotton fabric panel (similar to tablecloths of the 1950's and 60's), it features a beautiful tropical print of orchids and palm leaves with a coloring that feels very now to me. I have two panels listed, measuring 26" x 62"; I'm very tempted to keep one for myself (but then I walk into my workroom, see my overflowing stash and think better of it!) 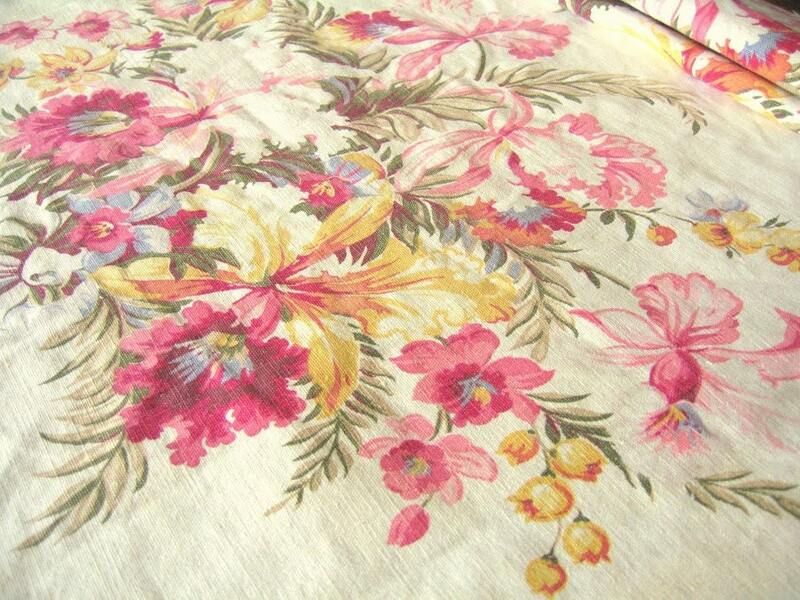 It looks like a perfect beach side resort fabric for pillows or bed linens; maybe a beach tote as well? Remember, just two panels so grab it before it's gone! 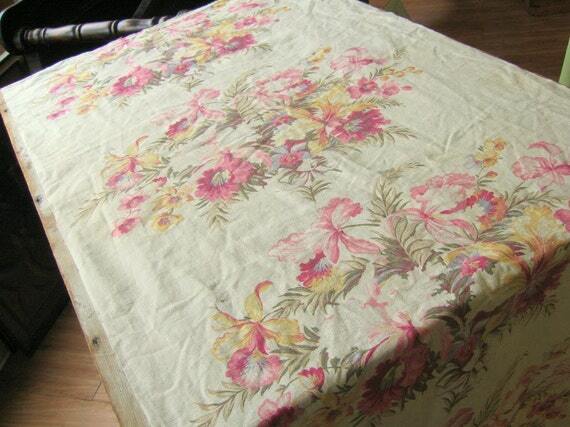 The print is really lovely with lots of detail; the colors are dark and rich. I currently have 4 yards (and then some that I've keeping for personal use) - and at a medium weight there is plenty to upholster a small chair or a create a set of totes, but certainly light enough still for a smashing dress or skirt. Grab it here! This past Thanksgiving, we got the news that my oldest and dearest friend was expecting! She opened her home to me in Houston when I was under treatment at MD Anderson, and every few months we visit again during my scans; so she, her husband and their adorable 5 year old son are like family and we were just ecstatic to welcome a new little bundle. I wanted to do something really special...make a quilt or crochet a blanket. A couple months later she calls; "you sitting down? It's triplets!" Fast forward, everyone is doing well - all boys and though they are due in June, we know they will be early. So, with THREE little ones, unfortunately quilts and blankets fell by the way side, but Auntie wanted to make them a little something. 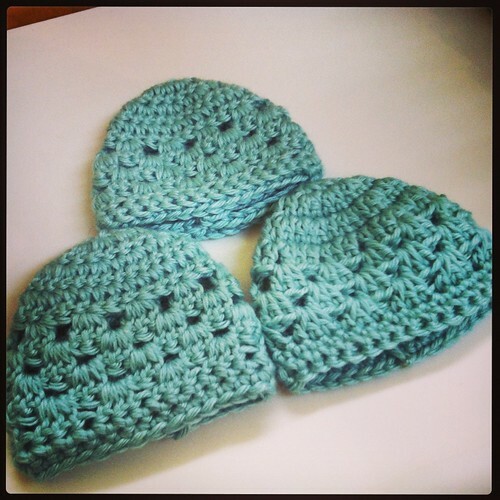 I decided to make some preemie beanies as they will be super tiny when they arrive. Unfortunately, there was not a lot available on Ravelry for that size and the patterns I found were incomplete or too feminine. I started playing around and once I had one hat complete - I realized quite by accident, I had written by own pattern! Using Stitch Nation Bamboo Ewe (so silky soft), I finished off the two additional hats and I had the pattern down pat! Really, its a very quick and simple pattern that is nicely gender neutral, so I hope others find it useful too. I've played around with it a little further and changed the yarn - a bulky yarn brings you to a nice newborn size without editing the pattern. Try Lion Brand Baby's First Yarn for a new take on this beanie. The pattern is free for download on Ravelry; please let me know how it works for you and what edits you use to make it your own. 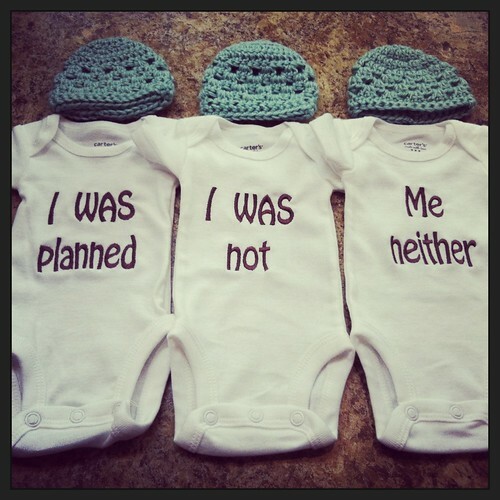 ***the triplet onesie set was a custom order I planned with my embroidery vendor from my store - she's agreed to make them to order, so contact me at the shop website should you find yourself surprised with similar news!